Nos studios et appartements sont situés dans le centre de Manhattan, près de l'Empire State Building et de Times Square (15 minutes à pied). Les principales destinations touristiques sont facilement accessibles via les principaux transports en commun, notamment le métro et les bus, ainsi que le service de voiture et le taxi de New York. Nous vendons des billets pour des visites touristiques et des billets de musique à Broadway au prix de gros. Pas besoin de faire la queue et de dépenser au prix de la fenêtre! The building itself is old and halls not very clean looking, they are renovating the lobby. The room was not what I booked and I feel it was a lesser room then what we booked. No explanation as to why they did not give us the right room. The tv kept cutting out and when I mentioned it to the office the response was .." it will be fine" it was not working the whole trip. No towel bar in bathroom, or shelf to put things on. It was handy to have the kitchenette. Just wish I had been given the right room . or at least a discount for not getting the right room. Location is great. Beds are old and lumpy and no comfortable chairs to sit on.. which is why we booked a different room to have a couch to sit on after a long day of walking. I never write reviews, so I feel bad doing this. But, wish I would have had a bit of a heads up on some of this stuff. Overall, not bad. Decent location. Mostly everything was within walking distance if you love walking lots like us. The building itself was a little.. different. The room, was exactly as pictured! However, the hallways were very dirty and didn’t smell the greatest (I feel horrible saying that, but wish I would have been prepared for that). The elevators are also INCREDIBLY slow, so had to leave extra time for that. The guy that checked us in was GREAT! Really liked him, very accommodating and even checked us in early. The lady that checked us out was incredibly rude. We asked for a later check out (just an hour) and she was not very nice, made it seem like it was the biggest inconvenience ever. When we did check out (earlier than the time we ended up agreeing on), she said ‘you’re finally leaving.’ Keep in mind, this was our first interaction with her and we are three very polite girls that don’t like confrontation. So that was a little off putting. Anyways, the room itself was fine (floor was a little dirty), but the building and service was less than ideal. Clean, comfortable, and convenient! I would definitely stay here again. 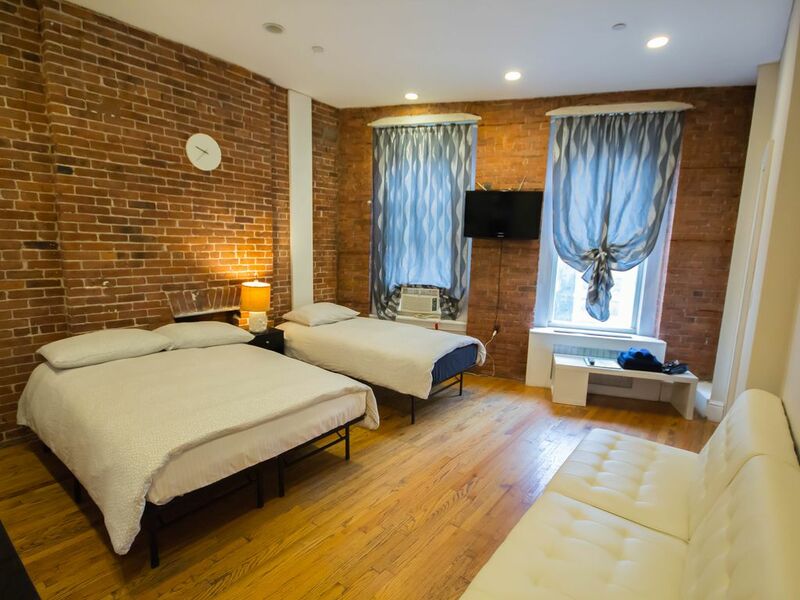 Had an enjoyable time at the apartment, it was clean and centrally located to Penn station and other tourist areas, which made it easy to walk out of the apartment and go to these areas. The apartment was a little noisy, not so much with the street traffic but with the apartment upstairs right above us , as it sounded like there was construction being done inside the apartment. We did mention to the front office about a loose towel bar in the bathroom, and that was taken care of very quickly!!! All- in- all a nice place that is inexpensive, meets basic creature comforts, and close to everything !!! Cette appartement est vraiment bien situé au plein centre de Manhattan donc pas loin du Empire State Building et le quartier Flatiron. Le bâtiment historique de l’appartement est intéressant - l’extérieur est très jolie, les couloirs/ascenseurs sont un peu vieux mais l’appart est propre, chaud, confortable, bien équipé - tout à été parfait; nous retournerons ici sans hésitation! Checked into room 574 on March 11...brightly decorated room with windows. We were happy. At 8AM the next morning, drilling, hammering and grinding started from the room above us. Pieces of plaster came down on us and all surfaces for several hours. We asked the hosts to clean up but they could not get to it until Tuesday, when all they did was change the beds. We complained several times that debris was still everywhere. Min offered my friend a mop to clean up a mess we didn't make. We refused and after more discussion she and the other host agreed to clean the room, offered another room and said she had no control over what the owners of the building did. We asked her for a partial refund for having to stay in a construction zone, but she said we would have to ask Travelmob. So I'm asking you for a partial refund. $200/day is a lot for putting up with such a loud, messy lodging.